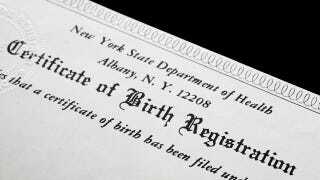 A 59-year-old New York woman's effort to remove her father's name from her birth certificate could reshape an outdated presumption in American law that the children born to married women are always their husband's. Nina Viola Montepagani says she always had doubts about who her father was, but the story of her mother's ill-fated extramarital romance has only come under scrutiny after her mother's alleged lover died, leaving an inheritance worth millions. Montepagani tells the New York Times that she loved the man who she knew as her father, Giuseppe Viola, who died in 1987 at the age of 95. However, she now believes a wealthy Italian doctor named Dr. Sebastiano Raeli is her real father. Viola was an Italian immigrant who lived in Brooklyn. He returned to the small italian town of Montemurro four times during the course of his life to find a bride. After his first wife died, he married Anna Aliano, Nina's mother, when she was 28 and he was 58. After their wedding in September 1950, he returned to Williamsburg, and Anna went to Rome to wait for papers that would allow her to come to America. Nina claims that while in Rome, her mother had a romance with Dr. Sebastiano Raeli, and got pregnant in Italy in September 1951. Anna left for America in October, and gave birth nine months later. Throughout her life, there were various clues that Dr. Raeli was her biological father. Nina's full first name is Sebastiana. In a photo from her christening, she's held by Dr. Raeli, who was visiting from Italy. Her mother hints at a relationship in letters to Dr. Raeli, and during a fight with her husband, she told Nina not to call him "daddy." Anna died in 1957 of cervical cancer, and Nina was raised by Giuseppe Viola. Dr. Raeli once visited Nina while they lived in Albany, and tried to take her back to Italy, saying "She belongs to me; she should come with me." However, by the end of his life he denied that she was his daughter. The doctor had developed a hotel empire, and in 2006 he left a $100 million fortune to Rome's Tor Vergata University. In two rulings over the past year, a State Supreme Court justice in Manhattan, Michael D. Stallman, agreed and seemed skeptical of her claim to be the daughter of a wealthy Italian. "Petitioner," he noted, "was born during the marriage of her mother to Joseph Viola." The law's presumption that children born to married parents are "legitimate" is one of the strongest in the legal system, he wrote. Nina and her lawyer argue that she shouldn't be held to the "social mores of the 1950s," since times have changed and it isn't as shocking to suggest that a woman could give birth to another man's child while married. As for Nina, it's plausible that Dr. Raeli was her biological father, and at the very least her mother seemed confused about the paternity. Though since she didn't leave much solid evidence, this may be a case that even Maury Povich can't solve. Image via Nancy Catherine Walker/Shutterstock.